You may have heard about the recent Pew Research Center study that shows millennials (born roughly between 1980 and 1995) fleeing Christian churches to occupy the ranks of the “nones,” those professing no religious affiliation. But how much do you know about the decade that gave birth to the millennial generation? The Eighties witnessed the rise of the Christian Right and the end of the Cold War, the dusk of disco and the dawn of MTV, the emergence of the AIDS crisis and the decline of the welfare state. How did the culture wars of the Eighties shape the religious landscape and popular culture that have gotten us to where we are today? Revisit the “Age of Reagan” by taking a tour through some of the decade’s religious highlights—or learn what you missed, if you were born too late to experience the turbulent Eighties yourself. Featured image credit: Church By Jeff Sheldon. CC0 via Unsplash. Anthony Petro is Assistant Professor of Religion and a member of the Women’s, Gender, and Sexuality Studies Program at Boston University. 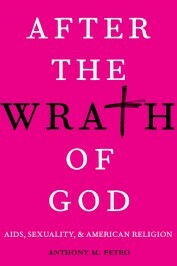 He is the author of After the Wrath of God: AIDS, Sexuality, and American Religion.